It has been great to read all the entries from people about their (or their team’s) greatest achievement in 2008. I thought I would just round it off with a final story of mine. It’s about the South Asian adaptation of the thirteenth edition of Kotler:Marketing Management. And while my colleagues at higher ed editorial will probably be muttering, “There she goes about Kotler, again…(and I do tend to, ahem, become a little obsessed by the book around the time it’s about to come out, so they know all about it), I thought it would be interesting for others to know a little more about the behind-the-scene process. This book was due to come out in 2008 but work on it had actually started in 2007. Since this was a part of the Pearson global initiative, all the teams participating in the program started participating in conference calls from June 2007. It was fascinating to discuss various issues, participate in the planning, and share the details of the project with colleagues as far away as Australia, USA, UK, Canada, and Singapore, to mention just a few. Sometimes we would forget the time difference and the Australian team members would often (finally) say that it was 10 pm there and we needed to finish! Part of the global initiative was to prepare shared features—case studies, questions based on them, suggested readings, and other highlights—that readers could access from all over the world. We were given a deadline of December 1. While it was touch and go at one point, and I must have made about a million calls to Bangalore and Ahmedabad, thanks to our adaptors Prof. Koshy and Prof. Jha and their graduate students, all the case studies were up and ready on the final day. Next, Vibhor coordinated with the U.S. team to have them up on the site and our version was quite a hit with the rest of the team. In the meantime, I was receiving chapters and finalizing them. Based on the feedback from the previous edition, we had added more case studies and advertisements from not just India but other South Asian countries. Calling up these companies, explaining what we wanted from them, and then following up with them to receive all the material was quite challenging. One memorable occasion, my desk phone was not working. I asked Amar if I could use his phone to call various companies in Pakistan. It was only when I entered his office and started making the calls, that I realized that there was a horrible smell in the cabin. It turned out that a dead mouse had been found in the cabin the previous day and although it had been removed, the stink remained. But, the calls had to be made… so with my dupatta around my nose, and taking very short breaths, I made those calls. There are many such stories but I will reserve them for some other time. I would just like to say that working on the book was an amazing experience. And I decided to write about it not because it was my achievement but because so many people contributed to it and this is my way of saying thanks to them. So, thanks to Jogu who pitched in to help with the editing, to Gaurav who worked on the proofs on behalf of the production team, to Madhur’s team for the marketing reviews’ design, and to Vibhor and Manav who helped with the supplements. And thanks also to the marketing team headed by Vikesh and Vikram who helped with the reviews and promotion, to the manufacturing team headed by Deepak, and to Naval’s team, who do the actual work of “selling” the books. Until the next timeJ! 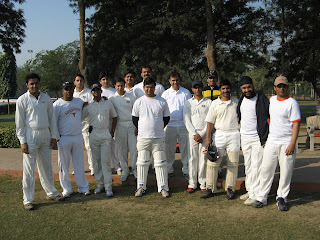 This time we played with Walter Kluwer Health on Saturday 3rd December 2009. It was a perfect morning for cricket both teams arrived at the venue at 9.00 am in the morning we warmed up while ground staff were still rolling the pitch .We asked Abhishek Shukla to join the Walter’s captain for the toss, the call was right . Looking at the early morning conditions we decided to field and started our attack with Abhishek and Binit. Both of them bowled pretty well and restricted the scoring to almost 5 runs per over .We rotated the bowling with myself Amit, Kamal, Nikhil and Rohit, We took wickets at regular intervals but the middle order batsmen were good and scored some good runs .Finally they scored 170/9 in allotted 25 overs . It was a challenging target. 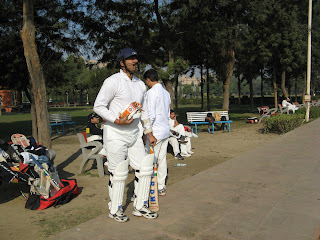 After a brief snacks session we started our innings. 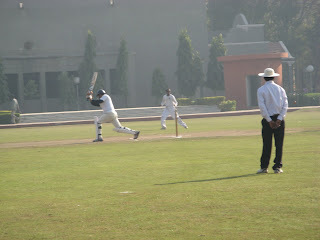 I was joined by Bharat Rana as opening pair and braved through some very good seam bowling . They tried almost every bowler and almost every tactics including short and body line stuff but couldn’t break the opening partnership. Myself and Bharat had 100 runs plus opening partnership and set the tone for rest of the players to come in and finish off, which Rohit Chopra did in style with blazing 44 runs . 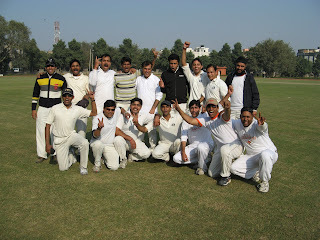 We won the match with by 7 wickets and 2 overs still to be bowled. My congratulations to the Pearson team who braved the fog and 10 degree temperature to come to the ground and play with full spirit and enthusiasm.